Welcome to Startup Monday! 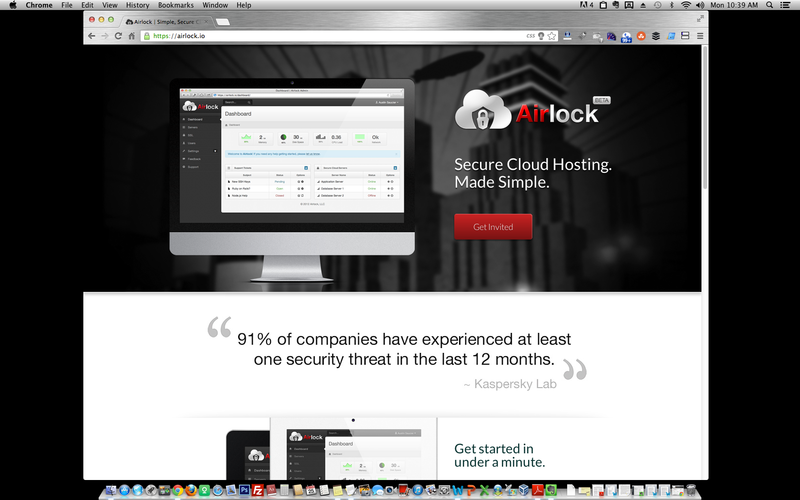 Today we’re featuring Airlock, a startup that’s poised to take the hosting sector by storm. I’ll introduce you to the founders, their vision and how they’re executing their idea. I connected with Airlock on Twitter and recognized the value they can add to a hosting sector that either delivers too little or costs too much. Lets get down to business! Nima: Why Airlock? From a founder, investor and consumer perspective. Austin: Airlock seeks to solve one of the biggest problems plaguing the tech industry today: security in the cloud. As a software and web developer, I was acutely aware of the security holes and vulnerabilities of the public cloud. I kept hoping someone would come along and provide a solution, because I needed to use it. Finally I realized that if I wanted it, I’d have to build it myself. Our goal with Airlock is to make the cloud a safer place for everyone. We’ve incorporated a wide array of security features that come standard on every hosting account—meaning you don’t have to pick and choose which security options you think you might need or can afford. You get it all: intrusion detection, hardware and web application firewalls, DDoS prevention, malware scanning, and more. The best part is: we manage it all. That way, our customers can focus on what they do best and leave the security stuff to us. In addition to security, we spent a lot of time creating a really easy-to-use control panel. We wanted it to not only be intuitive enough for beginners to just pick up and start using right away, but also powerful enough for seasoned experts. Ultimately, we want Airlock to help developers and startups save time and money. We won’t be announcing our prices and full feature set until launch, but anyone interested can sign up to be notified at www.airlock.io. Nima: What an exciting offering for SMBs! I spent 6yrs at Go Daddy and in that time I always felt there was a gap between managed vs dedicated environments. The less a small business owner has to think about their website the better. I signed up for a beta invite and encourage our readers to do the same. Tell us about the founders. Where did you meet and where are you from? Peter: The founders of Airlock are myself (Peter Lanier) and my close friend, Austin Saucier. We’ve known each other for years and share a diverse set of interests from philosophy and art to physics and technology. My interactions with Austin have always been stimulating and typically focused on problem solving. We just have this great synergy, so when he proposed building Airlock, it was a no-brainer for me. We’re both originally from the South but lived several hours apart. We knew that if we started a business together, one of us would have to move. Austin suggested going out West to the Rockies and my wife and I loved the idea; so we packed up our lives and headed to Whitefish, Montana. 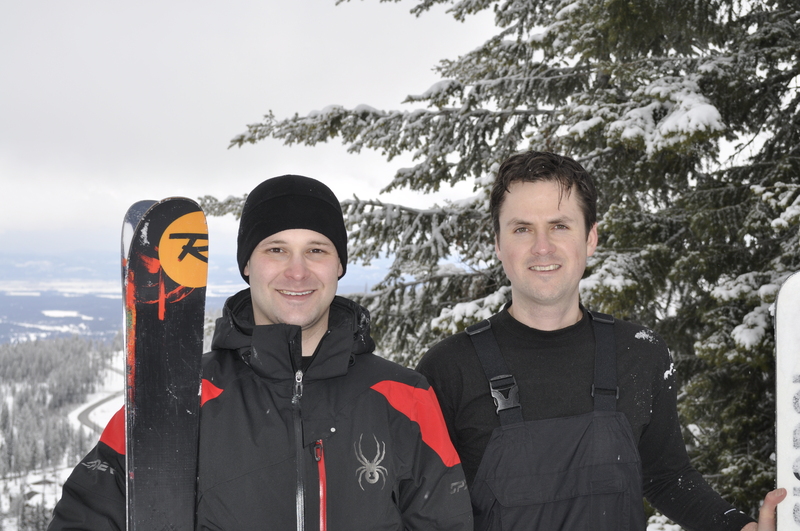 When we’re not working on Airlock, you can find us skiing, mountain biking or paddleboarding. Nima: My business partners and I invested 4yrs opening a restaurant and a night club in Colorado and can attest to how beautiful the Rockies are. We still visit about 4 times a year. Congrats on taking the leap of faith together! How did you come up with the idea and gain exposure? Peter: The idea for Airlock was born out of necessity. Your data is one of the most valuable things in your life—especially if you’re a startup or small business. Anyone who’s ever tried to set up a secure cloud environment knows how much time goes into the process. Developers usually cobble together a minimum of security measures every time they start a new project, which is a lot of time wasted just to reinvent the wheel. There are currently some legacy companies on the market that offer awesome secure solutions, but they’re marketed to big corporations with IT budgets and the pricing is ridiculously high. There’s just no way a bootstrapped startup or developer could cover those costs! We knew that if we could provide a comprehensive level of security that was simple to use at an affordable price, that word-of-mouth alone could spread like wildfire. And so far that’s exactly what’s happened—the response among friends and the tech community has been incredible, and we’ve had a ton of people request more information through our beta site. Nima: One piece of advice I’d like to share is make sure the user interface is simple and intuitive. If it looks technical you’ll lose the majority of SMBs that aren’t tech savvy. Consumers love Apple because they’re a tech leader with an insanely simple and beautiful UI. Marry strengths of a forward thinking engineer based company with beautiful aesthetics and you’ve got a viral winner. What strategies have you used that worked? Peter: We’re going to be launching within the next few weeks, so up to this point our strategies have been about building buzz. Twitter, beta communities, tech blogs and our friends have been helpful with that. We have some part-time team members/owners who are focused exclusively on PR and marketing, which has freed up our time to focus on the tech and business side of things. Nima: What mistakes have you made and learned from? Peter: Like all first-time startups, there’s a lot we learned along the way. Although we budgeted for unexpected expenses, next time we’d toss a bit more into that vast “unknown” category of costs. Communication has been another important area for improvement. We’ve had to find a good balance between sharing key information, without burdening each other with unnecessary news. Nima: What is your greatest asset? Peter: Our greatest asset is the growing community of experienced people out there who are incredibly generous with their time and knowledge. I’m convinced that there’s never been a better time in the history of the world to be an entrepreneur. Nima: I’d say it’s the best and worst time in history for entrepreneurs. Jason Calacanis talks about, “Time To Excellence.” The fundamental question is how long does it take to make an excellent product? @Jason goes on to say T2E has halved or more every 10 years since the 80’s. If you’re great at building excellent products T2E is scaling in your favor. If not, Jason says you’re, “Toast.” It’s something I’ve been thinking about and encourage our readers to read. Do you follow Lean principles or other? Peter: Like so many other entrepreneurs out there, we’ve been highly influenced by Eric Ries, Steve Blank, Paul Graham, 37signals and a handful of other gurus. I think that in the beginning there was almost too much advice out there to assimilate. Our challenge was learning to make our own judgements and figure out which methods we could actually apply to Airlock and which methods to ignore or reject. We’ve discovered there is no one-size-fits-all formula for all startups; each business is unique and has to become aware of its individuality. But, that’s what validated learning is all about. Airlock is still in private beta, so we haven’t had the luxury of the merciless feedback that the free market so generously provides. In the meantime, it’s been important for us to get out of the office and talk to local developers about their needs. Nima: Which domain registrar do you use for your domain portfolio? Nima: Why .IO? What made you a .IO believer? Peter: With the variety of TLDs available on the market, this decision was almost as important as choosing our name. We wanted it to be memorable and meaningful. In the end, we chose .io because of the association with I/O (input/output), which represents cloud computing in a nutshell. It dovetailed beautifully with all of our criteria, and we’re beginning to see all sorts of cool tech startups who use it too. Nima: Are you currently looking to recruit talent? If so, what positions? Peter: Not quite yet. But check back in a few months! Please join me in thanking the Airlock team for the opportunity to learn about their startup story. I encourage our readers to sign up for a private beta invite and follow the Airlock team on Twitter and Facebook. With Airlock’s commitment to security, ease of use and managed hosting I’m sure we’ll hear more about them in the coming months! Please leave a comment below if you have any questions for the Airlock team! I think they are out of business, their domain does not resolve. That was a typo error on my behalf. The link to the Airlock website is now resolving. Thanks for the heads up. This business model is really interesting, however it does propose a bundle of security issues in my head. For the sql injection protection, credit card exposure, cross site script protection, etc…is there a human looking through a companies proprietary code? Or is there an automated preg match system working to identify issues? Seems like this could be a very useful service, however, I can’t help to think about the secure problems that may arise. That’s a good question. We anonymously scan files on the network and check for vulnerabilities that match our algorithms.